What is a true story? So many films in Hollywood are ‘based on a true story’ it’s often hard to know where reality stops and the work of a screenwriter begins. Reality is rarely neatly resolved in under two hours which is what suits the silver screen. This film is a true story, of sorts, although it tells you it’s not on its opening title screen. I think the argument they’re making is that no film version of events will be as it really was. In some cases, even the people involved can’t agree on what happened, so how can anything be true? What we are sure of is that it’s based on a famous art theft, which was attempted by a group of students in their time in college. Spencer Reinhard (Barry Keoghan) is a student studying art at Kentucky’s Transylvania University. 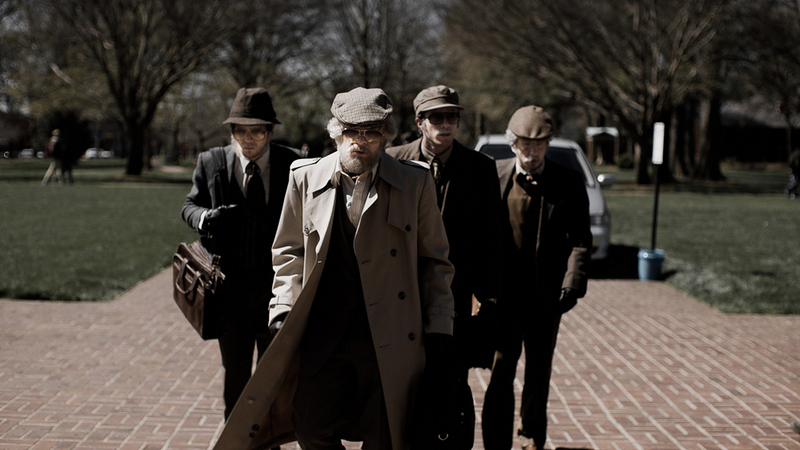 It is there he meets Warren Lipka (Evan Peters) and the two become good friends. When Spencer is on a tour of the library, he is taken to see some of the most valuable books in their collection. It is there that he sees John James Audubon’s “Birds of America”, which is now worth millions. Spencer sees the lax security of the library and mentions it to Warren, and so the seeds of this robbery are sown. And how do the would-be art thieves plan their heist? In the only way they know how, through studying films on the topic! Director Bart Layton previously worked on The Imposter (2012), which was an impressive documentary on an unusual topic. This film has a number of similar ideas and perspectives on the world, along with some quite inventive ideas and visual gags. The film uses interviews with the real people involved as well as recreating the events on-screen. The interviewees often dispute how the events happened which creates some difficulties for the filmmakers. Instead of struggling with this, they embrace it, making it into an interesting device. They change the characters halfway through a scene as the voice over disputes the age or height of the person involved! There’s a style and fluidity to the film that marks it out as something special. It’s a film that asks questions both big and small, and one that will certainly leave you with a smile on your face. Go check it out!